Humboldt Park residents were offered the opportunity to tour and meet the staff during an open house at the new University of Illinois Hospital and Health Sciences System Mile Square Health Center on Monday. 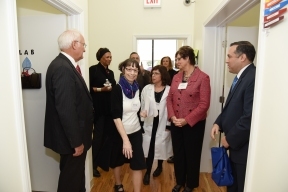 Residents had the chance to see what the new center offers, such as providing women’s health services to patients in the Humboldt Park community with disabilities or mobility issues. The open house, hosted jointly by UI Health and the UIC College of Nursing, included speakers Alderman Roberto Maldonado of the 26th Ward; Billy Ocasio, executive director of the National Museum of Puerto Rican Arts and Culture; UI President Robert Easter; UIC Chancellor Paula Allen-Meares; Dean of the UIC College of Nursing Terri Weaver; and Chief Executive Officer of Mile Square Health Center Henry Taylor. 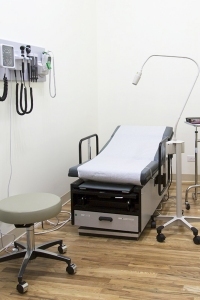 Mile Square Health Center, which opened its doors in May, offers OB/GYN services in a fully accessible space. The center also offers care for men and women of all ages, in addition to birth control, menopause management and newborn care. The center is staffed by family nurse practitioners and certified nurse-midwives and is managed by UI Health and the UIC College of Nursing. Mile Square Health Center aims to provide high-quality, affordable care that addresses the needs of the community. The Mile Square Health Center is located on 3240 W. Division St.